Gunmen Tuesday stormed an Afghan government office in Jalalabad during a meeting with foreign aid agencies, killing at least six people in the latest of a series of assaults in the eastern city. On the other side of the country a roadside bomb apparently intended for security forces hit a passenger bus and killed 11 people, as civilians once again bear the brunt of violence in Afghanistan. At least six people were killed and 14 wounded, Khogyani said, but he warned the toll could rise as security forces searched the building. As the attack began with multiple explosions, local representatives of foreign donors and agencies were meeting department employees inside the building. Several people had been taken hostage by the attackers, said Zabiullah Zmarary, a provincial council member. Khogyani said the two attackers were killed. In the western province of Farah on Tuesday the bomb which hit the bus killed at least 11 people and wounded 31. It is not clear why the militants targeted the refugees and repatriations department, but government buildings are frequently hit. 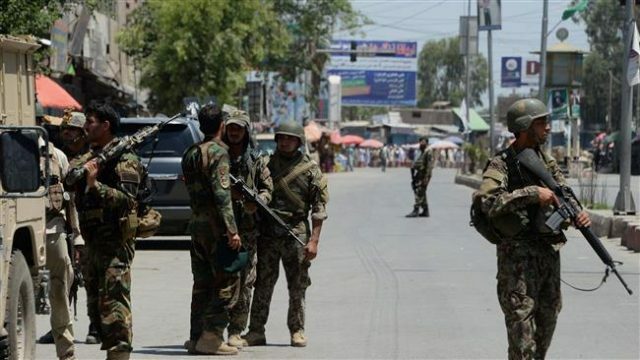 On July 11 gunmen raided an education department compound in Jalalabad, sparking an hours-long battle with security forces. At least 11 people were killed in that attack. All were employees of the education department branch and included the director.